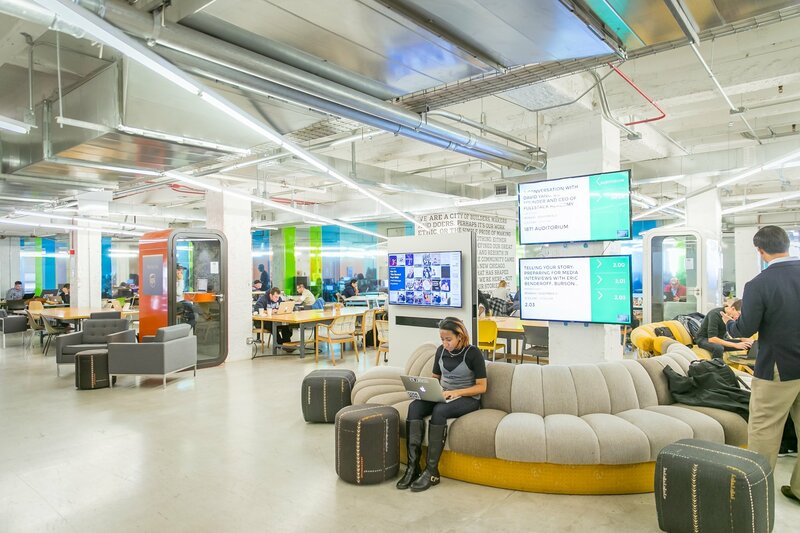 On 1871’s second anniversary May 2nd, we welcomed Facebook COO and Lean In author Sheryl Sandberg into our downtown Chicago Merchandise Mart space. After 1871 CEO Howard Tullman led her on a tour of our co-working facilities, Sandberg met with nine of 1871’s female entrepreneurs in 1871’s IMSA classroom to discuss women and their role in the technology industry. I am glad Sheryl is taking her Lean In message to recent graduates. I feel strongly that this is the time of life when women really need to start planning ahead. I remember early in my career my friends' raised eyebrows as I set up a bank account to provide for the years that I planned to take off once I started a family. Sheryl is right, you can always back off once you have children, but give it your all until the very last second. Lean in as far as you can. Sheryl was quite the inspiration. To enjoy casual conversation with a woman of her stature, having accomplished all that she has, was heartening to me — and I believe to the room at large. It gave me much hope for the future of women across the board — entrepreneurs and CEOs alike. 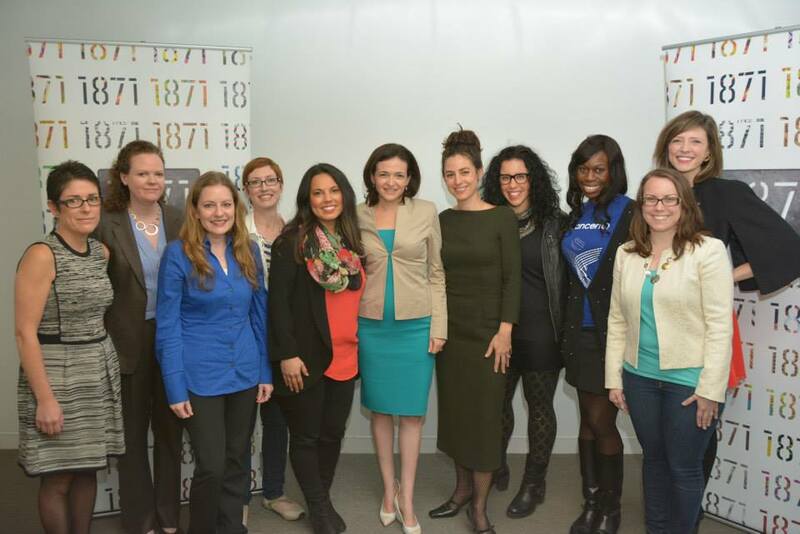 I was so nervous meeting Sheryl Sandberg. But before the meeting, I opened my purse and read a phrase I wrote in the back of my 1871 key card: ‘What would I do if I weren’t afraid?’ At that point, I took a deep breath and simply ‘leaned in.’ I sat at the table, participated, debated and enjoyed the meeting so much. I even showed Sheryl the key card with her phrase written on the back. She loved it! I want to thank 1871 for this amazing opportunity! Sheryl Sandberg has graciously accepted the role of punching bag since the release of Lean In, taking the hits on behalf of strong women everywhere. I know she's doing it for us, because she knows how much we need role models who are encouraging and who speak out, even when everyone calls them bossy and tells them to shut up. It was a privilege to meet this successful executive who refuses to be silenced. Agree with her mantra or not (I happen to eat up every word she says) Sheryl Sandberg has started a conversation that we as a society cannot continue to suppress. If we want more female leaders across sectors of the US economy and government, we cannot be silent and accept the status quo. Women, men, governments, businesses...we all have to start talking about how to help women achieve their goals personally and professionally, for the betterment of all. I guess I was expecting the woman who started the movement to be relatively stoic by this point. She has, after all, participated in thousands of these discussions. Isn't she numb to them? She was so real, so engaged, so personable and empathetic. My time with her will be one of the highlights of the 1871 experience for me. We all left with a renewed focus to get together monthly in our very own Lean In Circle. AND...She asked for more information on my company. What could be better? Everyone has them: people in life who you dream of meeting because they inspire you. Sheryl Sandberg is one of those people I had dreamed of meeting. As a woman in business and in technology, she is an incredible role model for me. And after the release of her book, Lean In, she became even more of an icon, giving voice to a feeling that so many women experience, but are afraid to articulate. She isn't afraid, and she inspires so many of us to be equally bold. Meeting Sheryl at 1871, and being able to hear her in person in an intimate setting, was a huge moment in my life as an entrepreneur. She validates everything I aspire to achieve, and that touch point reinforced that we all can do it. I walked away even more confident in my ability to succeed. Sheryl spoke to the need to change the narratives about women in leadership roles. It was awesome to see someone who is successfully leading one of the most powerful organizations in the world wield her power and influence in ways that improve the world for everyone. As an Impact Engine company and an educator turned entrepreneur, I know the important role business can play in solving social problems. Her Lean In work is a new twist on taking a personal platform and turning it into an important force in the business world. Great to meet her. 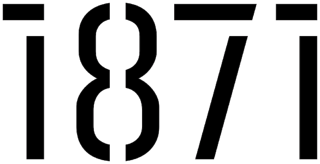 Thank you 1871 from ThinkCERCA, a women-led company working on helping people think critically and solve problems! 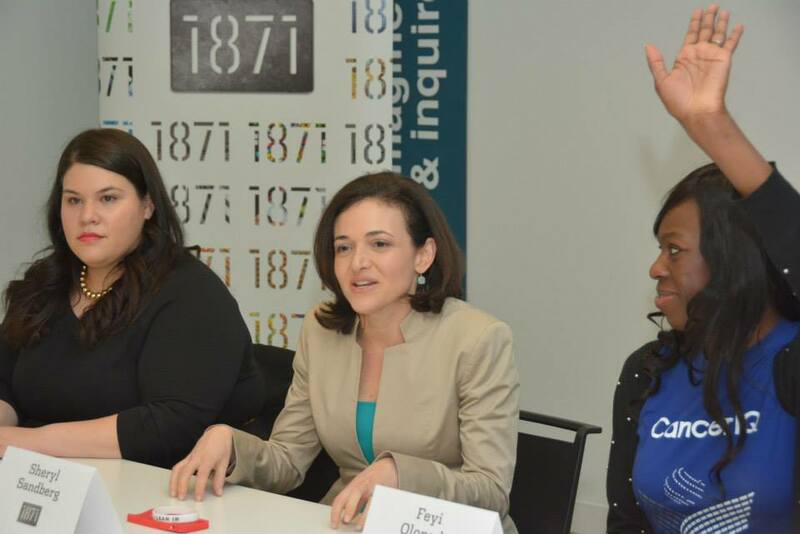 A strong group of female founders from 1871 were invited to the round table to chat with Sheryl Sandberg. Little did we know we would leave with our own new found Lean-In Founders Circle. I am inspired by Sheryl and can't wait to take these principles and apply them to the women at Ms.Tech and WeDeliver. Spending time with the other female founders at 1871 made me realize that we’re not just female entrepreneurs, many of us are entrepreneurs serving women. At Cancer IQ, we are using big data analytics to help doctors deliver personalized cancer care – starting with women’s cancers. Without women like Sheryl Sandberg leading by example and showing us the way – there could easily be a man leading this effort. Within this cohort of female founders at 1871, we have already shared valuable tips and tricks, discussed strategic partnership ideas, and will continue working together through our newly established Lean In Circle. Thanks Sheryl! 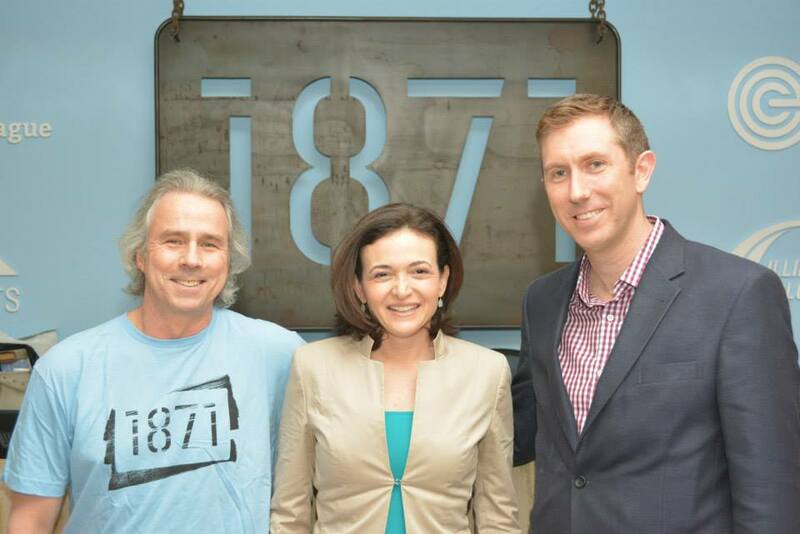 At the end of her visit, Sandberg posed for a picture with community members and was presented with an honorary 1871 logo. Sandberg’s time at 1871 left us even more inspired to support our FEMtech initiative to empower female entrepreneurs in Chicago. What a way to start our third year!